A Chinese research team has recently tested a Super Maglev prototype that could theoretically travel at 3000 km/h. A Chinese research team has recently tested a Super Maglev prototype that could theoretically travel at 3000 km/h. That’s three time the speed of a passenger jet, becoming the fastest mode of public transportation. The Super Maglev train goes through evacuated or partially evacuated tubes, reaching supersonic speed without the penalty of sonic boom and with a little power consumption. Dr Deng Zigang (leader of the project) states in a report. The only way to break this barrier is to reduce the air pressure in the running environment, which he has done in his tube by lowering it to 10 times less than normal atmospheric pressure at sea level. Dr. James Powell, former co-inventor of superconducting maglev in the 1960s, has since 2001 led investigation of a concept for using a maglev vactrain for space launch (theoretically two orders of magnitude less marginal cost than present rockets). However at the moment the vactrain (or vacuum tube train) is prohibitively expensive, but researchers at Southwest Jiaotong University in China say the technology can be put into operation in 10 years. 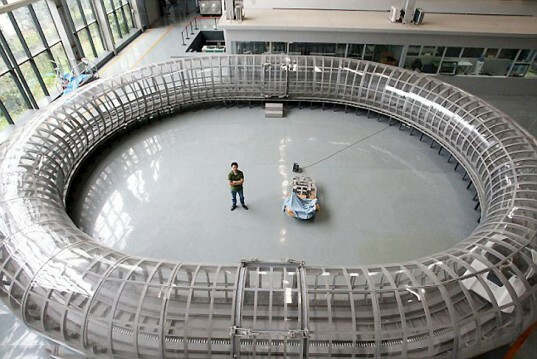 At the moment the test vehicle can accelerate at 50 km/h without passengers in a 6 meters diameter vacuum loop.